When the tragic fires struck California in November 2018, the air quality levels in the San Francisco Bay Area and Los Angeles region had extreme levels of pollution, enough where avoiding almost any outdoor activity was recommended. 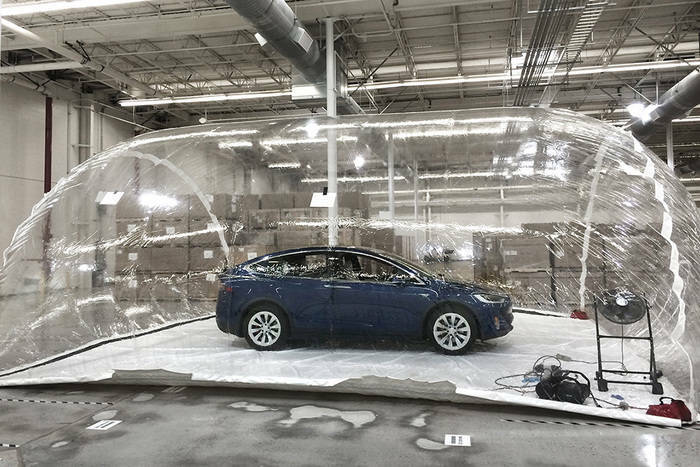 For those who were lucky enough to have Tesla Model X or new Model S electric vehicles with the HEPA filter installed, they were able to take advantage of a special mode call “Bioweapon Defense Mode” that Tesla Motors claims is 100X more effective than regular car filters. It not only removes smoke particles, gaseous pollutants and fine particulate matter, including mold spores, but also helps against allergens for those with asthma or other allergies. 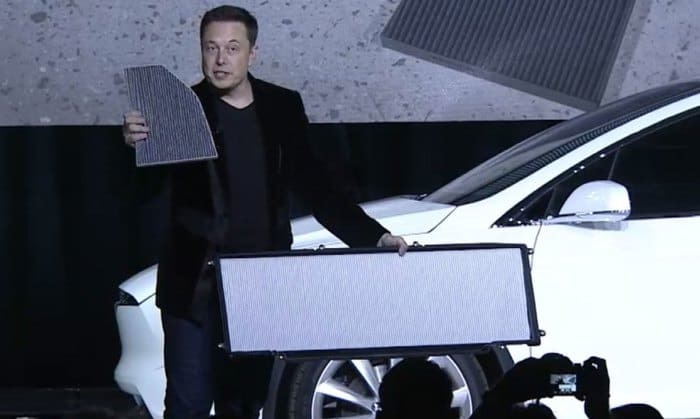 Does the Tesla Model 3 Have a HEPA Filter? Good, but not hospital grade. S & X were designed to be proof against an actual bioweapon attack. Requires a giant filter with separate acid & alkaline gas neutralization layers. Not enough room in Model 3. Here is a video showing a Tesla Model 3 owner testing the recirculation mode. After about 10 minutes of being on recirculation, the air is as clean as using a HEPA filter. Quite impressive! Normally the PM 2.5 level for good quality air, according to the EPA, is below 12 µg/m3. Above 150 µg/m3 is considered unhealthy. For reference, the air in Beijing averages around 56 µg/m3 and 20 µg/m3 in Los Angeles. For this test, Tesla pumped particles at 1000 µg/m3 (very dangerous levels) to see how effective the HEPA filtration system in the Model X could be. 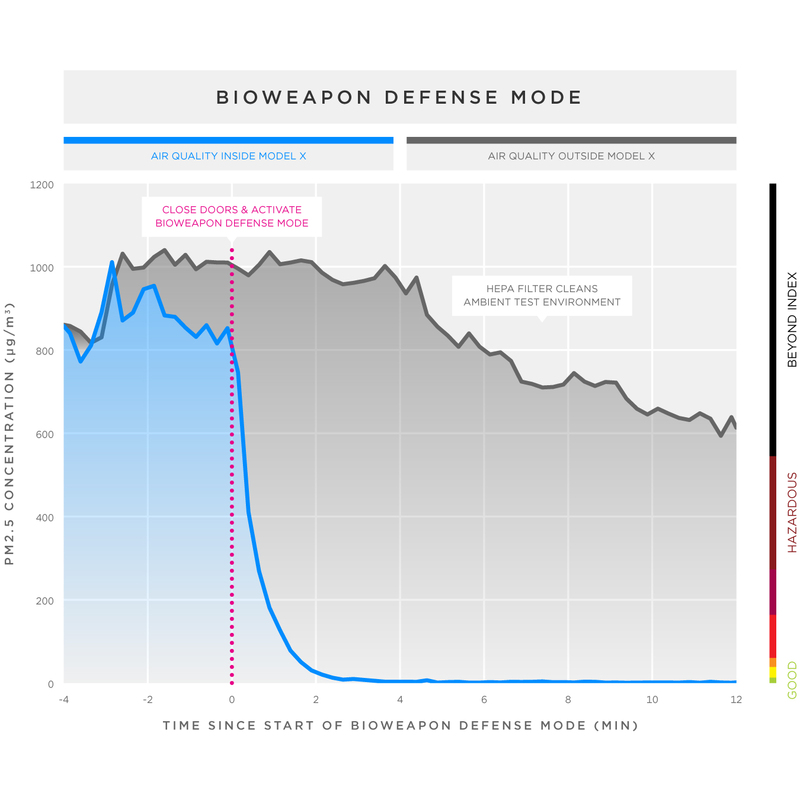 Within two minutes in Bioweapon mode, it was able to bring PM 2.5 levels to almost undetectable levels. You’ll then hear air flow go to maximum as it creates a positive pressure inside the cabin to prevent outside air from leaking in. In addition, any outside air will now go through the HEPA filter. Does the HEPA Filter Work in Automatic Climate Mode? From what we can tell, the HEPA filter does not seem to be used when climate controls are used normally in automatic mode. It’s only employed when you turn on the Bioweapon Defense setting. 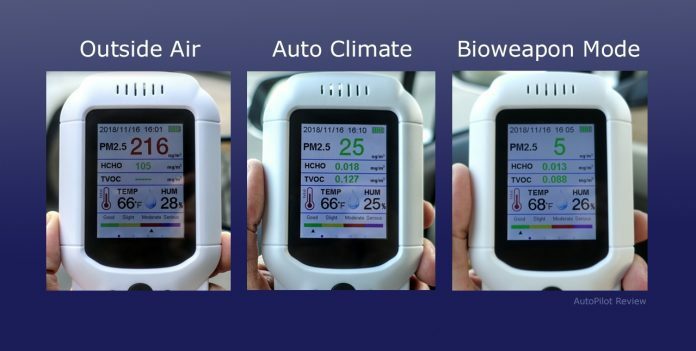 We tested a Model X with a HEPA filter installed during November 2018 when California wildfires blanketed the Bay Area with unhealthy levels of smoke particles (PM 2.5 of over 200 µg/m3). Here’ what we found. We first measured the air quality outside at around 216 µg/m3. After going into Bioweapon mode, the air quality was measured at around 6 µg/m3 after a couple minutes. We turned off Bioweapon and switched to automatic. Reading was 25 µg/m3 after about 10 minutes. After we opened the Falcon Doors, the air quality jump back up to the original high level very quickly. So there you have it. The HEPA filter work as advertised. If you’re in a smoky situation, just be sure to activate the Bioweapon mode to get the full benefit of the giant HEPA filter.